Stay abreast of the most up to date policies and advocacy topics in Pediatric Emergency Medicine. Two years ago one of my colleagues sent a reminder that June 21st is ASK day and that we clinicians should support this day as Pediatric Emergency Medicine Physicians. ASK (Asking Saves Kids) is a day that the American Academy of Pediatrics and the Brady Center to Prevent Gun Violence have promoted to encourage parents to ask about the presence of unlocked guns in the homes where their children play. ASK day is held annually on the first day of summer, a season where children spend a lot of time in the homes of others. As a PEM Physician I am very cognizant of safety. I ensure that my children are always buckled into car seats with whomever drives them, I ask about swimming pools and pets when they visit others homes and ensure that grandparents medicines are put up when we visit. But I had never asked about the presence of unlocked guns in the homes my children visited. I embarked with trepidation and asked the parent of my son’s best friend. After I completed this uncomfortable conversation I began to reflect if this was a difficult conversation for me a pediatric emergency medicine physician who has seen multiple children harmed by firearms imagine the difficulty for other parents without a similar perspective. Furthermore we asked parents if they felt their child could identify a real gun, then subsequently asked children the same question. Children were then shown an image of two handguns one real the other a toy and asked to identify the weapon. This is compelling evidence that we have a problem—perhaps some more than others. Opioid addiction is a frequent challenge for those caring for adults in the Emergency Department with some centers (e.g., rural) seeing more of this than others. Those who care for injured and ill children are left with two important questions: (1) What is the evidence regarding opioid addiction in children? (2) To what extent is the management of acute pain in the Emergency Department contributing to an increase in opioid related morbidity and mortality? You would expect that a large percentage of opioids are prescribed from Emergency Department visits. That is, after all, the place where we usually go to address severe pain. Indeed, Emergency Medicine physicians have been targeted as one of the top specialties prescribing opioids. FDA data from 2009 shows that Emergency Physicians prescribe 4.7% of opioids. However this reflects short acting opioids and the top prescribers are responsible for a far greater percentage: Family Medicine 26.7%, Internists 15.4%, Dentists 7.7%, Orthopedic Surgeons 7.7%.4 In a 2016 study by Chen et al. 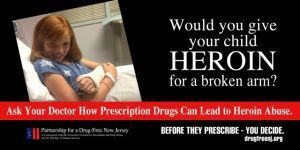 Emergency Physicians ranked 9th in opioid prescribing and the top eight physician groups were responsible for more than 25 times as many opioid prescriptions as Emergency Physicians.5 An analysis of opioid prescribing and subsequent heroin indicates that “1 new heroin abuser might result from the administration of opioids to approximately 7,864 patients.”6 While prescribing practices by Emergency Physicians are a valid target for analysis and guidance, their contribution to the crisis is not clear. For the past several decades specialists and researchers in pediatric pain have gradually succeeded in dispelling the misconceptions that younger patients do not feel pain and that opioids are more dangerous for them than poorly treated pain.7 One of the ironies of the current attention to prescribing practices is the change in terminology. For many years advocates for better pain treatment have urged colleagues to stop using the term “narcotic” when describing opioid use for pain management. The term has a pejorative connotation that many found counterproductive in treating pain. Now even lay people know the term “opioid” but in the context of opioid misuse. This shocking message may be working. We now see phrases in the literature such as “Emergency Department: The birthplace of opioid addiction” and “Opioid-Free Emergency Departments”. How will these attitudes and efforts eventually affect the care of your pediatric patients? Pendulum swings in public opinion are not surprising. Our job is to temper valid concerns with evidenced-based approaches and thoughtful analysis to effectively address problems without creating new ones. Emergency Medicine physicians need to be front and center in tackling these concerns and not cede that role to those with less expertise and perspective. The first step is improved education and research. Who is at risk for addiction (e.g., age, co-morbidities)? Where are the misused opioids coming from (e.g., valid prescriptions vs. illicit production or diversion)? Physicians who prescribe opioids should have a clear understanding of the pros and cons of opioids for different conditions and the difference between opioid tolerance, dependence, and addiction. We can lower the risk of diversion by reducing the number of pills prescribed to adequately control severe acute pain without prohibiting the limited us of these medications in appropriate circumstances. We should continue to look for safe and effective alternatives to opioids. Heed the phrase: The Right Tool for the Right Job. Just as using opioids for less than severe pain introduces unnecessary risk, relying on low potency analgesics such as Nitrous Oxide and NSAIDs for severe pain will result in needless suffering and undermine the relationship with our patients and their families. Finally, we can draw lessons from similar challenges in changing physician behavior such as the efforts to reduce inappropriate antibiotic use and ionizing radiation from unnecessary CT scans. Like antibiotics and CT scans, opioids are an important tool for patient care that have a role for specific indications. There is no doubt that creating guidelines for opioid use will present unique challenges as pain is ultimately a subjective data point and pain experiences are highly multi-factorial. That challenge, however, is not insurmountable and calls for a nuanced approach that addresses the concerns of patient, clinician, and society. US Department of Justice. Automation of Reports and Consolidated Orders System (ARCOS). Springfield, VA: US Department of Justice, Drug Enforcement Administration (DEA); 2011. Paulozzi LJ, Jones CM, Mack KA, Rudd RA. Vital Signs: Overdoses of Prescription Opioid Pain Relievers—United States, 1999—2008. MMWR 2011; 60(43):1487-1492. Greene J. Amid Finger-Pointing for an Overdose Epidemic, Emergency Physicians Seek Pain Control Alternatives. Ann Emer Med 2016; (68;2) 17A-20A. Chen JH et al. Distribution of Opioids by different medicare prescribers. JAMA Int Med. 2016;176;259-261. Yealy DM and Green SM. Opioids and the Emergency Physician: Ducking Between Pendulum Swings. Annals Emerg Med 2016;68(2) 209-212. Finley GA and McGrath PJ (eds). Acute and Procedural Pain in Infants and Children. Seattle: IASP Press, 2001; 151, 159-160. Nationwide, neglect is the overwhelming cause of maltreatment. In 2015, three-quarters 75.3% of all child victims were determined to be neglected. This was followed by physical abuse at 17.2% and sexual abuse at 8.4%. 6.9% of child victims were listed as being victims of “other” forms of abuse such as exposure to parent drug and alcohol abuse and threatened harm.2 The total exceeds 100%. It is important to understand that being a victim of one type of abuse does not make a child immune to other forms. 86% of child victims suffered from a single type of maltreatment, whereas 14% had polyvictimization with neglect and physical abuse being the most common combination. 2 Therefore, if evaluating a child for one type of maltreatment, it is important to look for signs or symptoms of other forms of abuse. In closing, child maltreatment is a medical condition that should be on the radar of all medical personal in the ED. The signs and symptoms of abuse can mirror those of normal injury. The difference is history and intent. Kellogg ND (2007) American Academy of Pediatrics Committee on Child Abuse and Neglect. Evaluation of suspected child physical abuse. Pediatrics.119(6): 1232. (2010). CAPTA Reauthorization Act of 2010: Report (to accompany S. 3817). [Washington, D.C.: U.S. G.P.O. King, A. J., Farst, K. J., Jaeger, M. W., Onukwube, J. I., & Robbins, J. M. (2015). Maltreatment-Related Emergency Department Visits Among Children 0 to 3 Years Old in the United States. Child Maltreatment, 20(3), 151–161. Allareddy, Veerajalandhar, et al, Hospital Based Emergency Department Visits Attributed to Child Physical Abuse in United States: Predictors of In-Hospital Mortality. 2014: 9(6), e100110. Alexander RC, Levitt CJ, Smith W (2001) Abusive head trauma. In: Reece RM, Ludwig S, eds. Child Abuse: Medical Management and Diagnosis. 2nd ed. Philadelphia, PA: Lippincott, Williams & Wilkins: 47–80. 20 million people—more than the populations of Florida or New York. 20 million people who are your neighbors, worship with you, go to school with your children, sit next to you at the cafe. 20 million people in the waiting room of your doctor or your dentist. 20 million people who stand to lose their health care if the Affordable Care Act (ACA) is repealed. As physicians, we know these 20 million people. We care for them; we laugh and cry with them. We partner with them to ensure they are healthier than before we met. This, indeed, is exactly why we became physicians: to care for human beings, to promote health, and to alleviate suffering. Above all, we all pledged an oath to do no harm. We care for these 20 million because the ACA finally allowed them to walk through our doors, providing a route into the health care system for many that was previously closed. We know that if these 20 million people lose this access, they are likely to become sicker and more likely to die. It is no coincidence that the word “care” is used to describe the role of physicians, nurses and other health care practitioners, in the lives of our patients. Those of us who provide that care have literally listened to the hearts—and more importantly—to the stories, of those 20 million. Every single day, we care with every fiber of our beings. We know how deeply these 20 million human beings care as well. If the promise to repeal the ACA is realized, and these 20 million men, women and children lose their health insurance, we will be doing harm. Great harm. Regardless of your politics, providing every one of these people with health insurance is good for them and for our country. We do not pretend that the ACA is perfect; we have borne witness to the fact that it is, in fact, very imperfect. As a tremendously contentious issue with fervent disciples on both sides, we are familiar with the deeply felt arguments from both supporters and detractors. What is often lost in the debate, however, is the voice of the 20 million, and the stark reality of their plight. As doctors, we know the value of looking into the eyes of our patients, listening to their stories, and building authentic partnerships to cure illness, alleviate pain, and preserve health. America cannot allow the health of her citizens to be used as a political football. As an ethical and moral issue, the lives of 20 million Americans cannot be sacrificed on the altar of partisanship. The United States remains the only major industrialized nation that treats health care as a commodity and not a basic human right. We debate budgets and ignore justice. We choose to believe in the solidarity and resilience of Americans. We choose to believe that empathy can be apolitical. We choose to believe that Americans want to help one another, independent of politics. We choose to believe that our policymakers want to look us in the eye and say that they will make sure that everyone has meaningful health coverage. We choose to believe that our country and our lawmakers will not allow the 20 million to lose their health care coverage. We join five major professional organizations in calling for a compassionate approach that keeps the needs of Americans front and center. This is not about Republicans or Democrats, about Trump or Obama. It is about 20 million real Americans with friends and loved ones who want to be healthy. We physicians cannot ignore them, for they are our patients. You will still see them everywhere, except in our waiting rooms; to us, they will become invisible. We cannot allow this to happen, we cannot allow this harm to come to them. Because we took an oath. I represent the 48 Physician Advocacy Fellows of the Institute for Medicine as a profession who collectively launched the national 20 Million Lives Campaign at our annual meeting in January. Please join us at www.20millioncampaign.com.